The F100/F110 Test Cell in Busan, South Korea has been upgraded to a modern T-20B hybrid with data recording, etc. The outdated system was dismantled and extensive repairs were made to the equipment at Celtech’s factory in Carlsbad. Repairs and refurbishment took under a year to complete and re-commission. 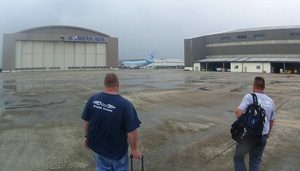 Atec field teams were onsite at the Korean Air Depot for two weeks installing the updated control cab, fuel system, and thrust stand. Many issues and challenges were solved by our FSRs and KAL groups to get the test cell verified and run through PMEL. 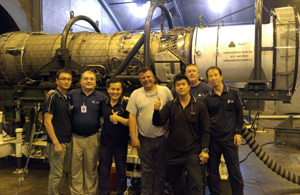 F100-220 and J79 run tests were successfully performed and the test cell has been signed off. “The test cell was successfully upgraded. No matter how difficult the challenges were to overcome, we were able to complete the task. 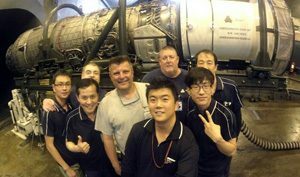 I had a great experience during the two weeks with James Betus, Rich Bryan and Kaveh Dadkhah,” said Jeong Seokwon, KAL engineer. KAL is providing depot-level maintenance for many aircraft to support the USAF. “KAL is helping to save the USAF money by servicing the F-4, F-15, F-16, and A-10 aircraft,” said Mike Rigdon, Celtech President. “Celtech realizes the importance our Korean ally represents in the political situation in the South China Sea and the Pacific Rim,” continued Rigdon. As older aircraft are being examined and flight life extensions become a popular topic, we understand how sustainment and cost reduction have become a challenge. “Our companies can help with repairs, additional testing needs and technology refreshment. Atec holds the USAF IDIQ Contract for Provision, Repair & Support of USAF IM test cells worldwide. We have been the primary supplier of T20 turbojet and T21 turboprop ground based test systems for over 25 years. Our support and supply of legacy equipment continues today,” commented Rigdon. Celtech Corp. innovated the T20C to include testing for the F404/414 engines with EDACS in Korea at significant cost savings. Our companies have also successfully integrated modern J85 & TF34 testing on the M37/T20 test stands many times, at home and abroad. The turboprop engines used on the C-130/C-130J Hercules, LM-100, P-3 Orion, EP-3 Aries, E-2 Hawkeye, C-2 Greyhound and C-27J Spartan are also tested on our equipment. Together our companies are servicing over 300 locations worldwide. “Atec and Celtech are here to help support our air allies in any way possible,” finished Rigdon.